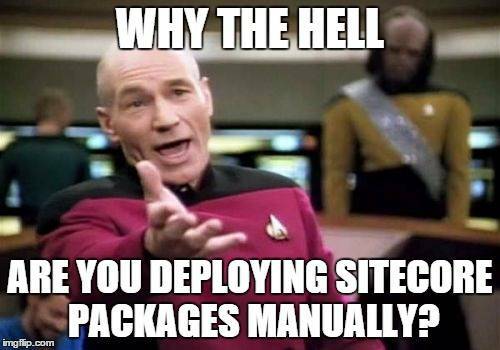 During my first couple of Sitecore projects the packaging and deployment of Sitecore items was a manual struggle process. Item packages were created using the Package Designer and the resulting packages were installed using the Installation Wizard once the website was deployed. Developers can easily forget to include required items in the package (especially if they pick items the static way instead of the dynamic way). Install the packages in the right order (and select the correct installation options). This manual process is very tedious and error prone, even when it’s done by just one person. Fortunately several tools emerged over the years which make packaging and deploying Sitecore items a breeze. One of the tools that made my life a Sitecore developer easier is called Sitecore.Ship. 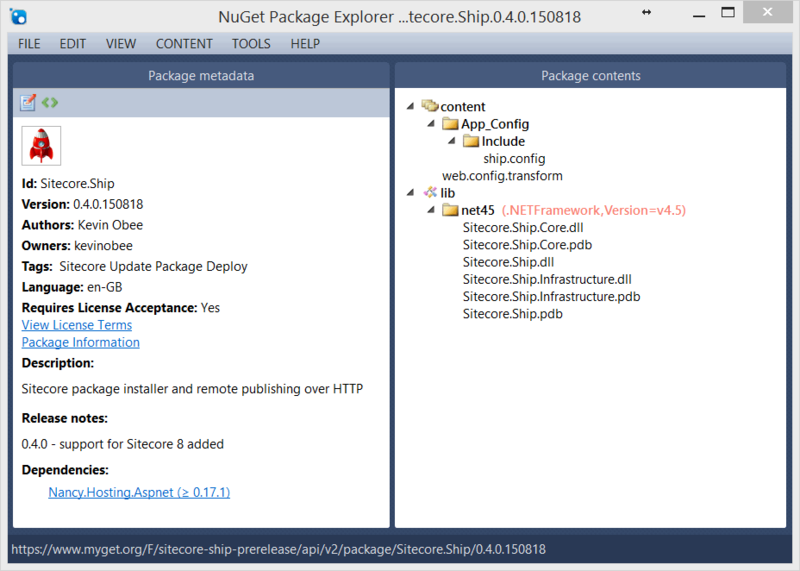 Sitecore.Ship is a small Sitecore module developed by Kevin Obee and it allows the installation of Sitecore packages (both .zip and .update) using HTTP requests. The packages could be either generated by TDS, Courier or… still by hand (but you wouldn’t do that anymore right? ;). It’s a compact module which only does a limited number of things and it does these right. I usually prefer smaller tools over larger ones because smaller tools are easier to understand and work with. And if there are less moving parts there is also less risk that something breaks. It can be easily integrated in a continuous integration setup using a scripting language such as Powershell. 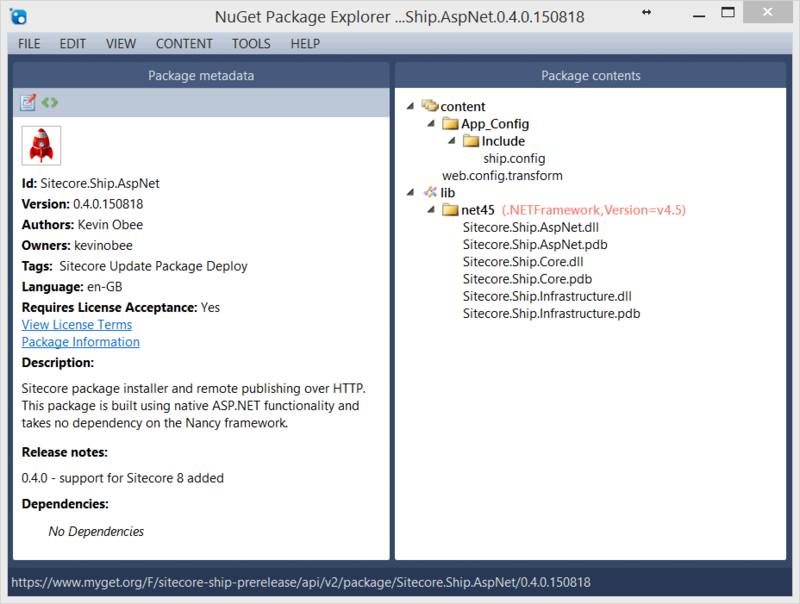 Sitecore.Ship - This version uses Nancy, a lightweight .Net framework for building HTTP based services. Note that your web project will add a dependency to Nancy.Hosting.AspNet. Sitecore.Ship.AspNet - This version uses a plain ASP.Net HttpHandler implementation and therefore requires no additional dependencies. Sofar I’ve mainly used the Sitecore.Ship.AspNet version because I didn’t want to introduce additional dependencies to my projects. I’ve used the 0.3.5 version for Sitecore 7.1 and the 0.4.0 (pre-release) version for Sitecore 8.0 (from Initial up to Update-5). Let’s have a look what’s in the NuGet packages of the 0.4.0 pre-release version (since we’re all using Sitecore 8 anyway right? ;). Sitecore.Ship.Core.dll - Contains the interfaces, domain objects and services for recording the package installation and parsing the packages. Sitecore.Ship.Infrastructure.dll - Reads the configuration, performs logging, reads/writes the package deployment history and performs the actual installation of items using the Sitecore API. This assembly has dependencies to Sitecore.Kernel, Sitecore.Logging, Sitecore.Update and Sitecore.Zip. Sitecore.Ship.dll - Contains Install and Publish modules (based on NancyModule) which define the HTTP requests that can be executed. Sitecore.Ship.AspNet.dll - Contains the SitecoreShipHttpHandler and the various CommandHandlers for uploading and installing packages and publishing items. Once the website files are deployed you can issue a POST request to <website>/services/package/install/fileupload in order to upload and install a package. Or do a smart publish by doing a POST to <website>/services/publish/smart. As usual though the devil in the details and while the wiki page gives some basic guidance how to start using Sitecore.Ship it is not a complete end-to-end guide how to integrate it in your solution. In the next blog post I will explain in detail how I’m using Sitecore.Ship with Powershell and cURL in continuous integration setups with tools like Visual Studio Release Management or Octopus Deploy.